A new tool came was added with the previous update: “Populate calendar”. 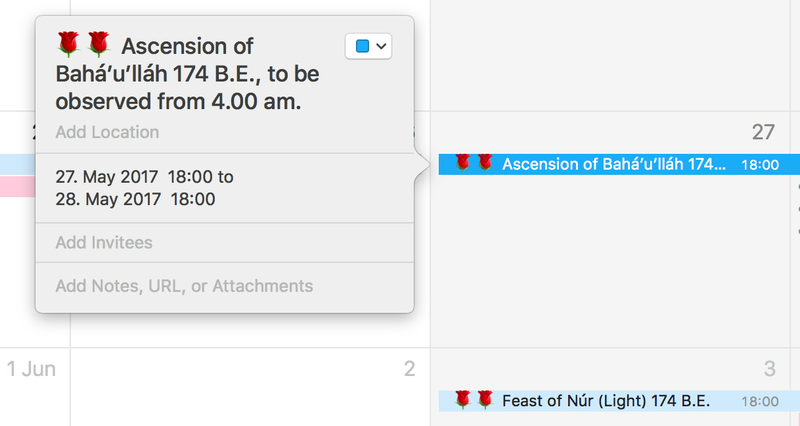 With this tool the app can create events for all Bahá’í holydays, nineteenday fasts, the start of Ayyám-i-Há etc., into any of you calendar accounts (as configured on the iPhone). If e.g. you add the events to you work-calendar; you can see the holydays while planning meetings, and possible make it easier to take those days off. The events will of course also show up in all the places where you display you agenda, like “next events”, on an Apple Watch etc..
You can edit the events as you please (they are not tied to the app), and adjust the nineteenday fest’s address/location and time to match your local celebration, or event set an alert.All events are added according to the sunset-times and settings of your app and current location. If you search for two roses, you will find all the Bahá’í events listed. See example screenshot from my shared family calendar, which I see both a work and in private. 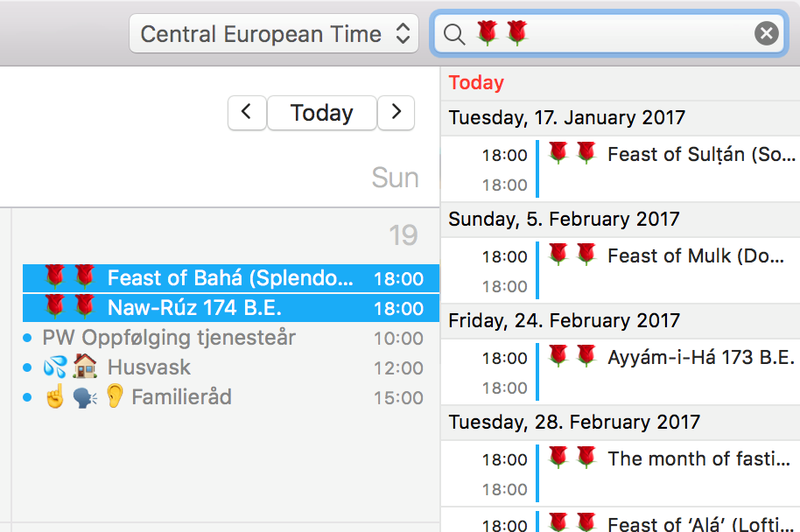 When I search for the roses on my Mac (see photo), I get all the dates listed. Hope you’ll find this feature useful. This entry was posted in News on March 12, 2017 by Schulz Media & Consulting. Happy joyous Ayyám-i-Há to all ! “…these days of giving that precede the season of restraint. …and talking about the “season of restraint” — the fast: Remember that it starts on the Gregorian March 1st this year. Please spread the news… not all Bahá’ís know it yet. Note that you can see the sunrise and sunset times of each day according to your current location, as you scroll through your events in the app. This makes it easy to plan according to breakfast and dinner-time — specially in the far north/south where the times change significantly during the fast. The above quotes are from Bahá’u’lláh in The Kitab-i-Aqdas. To kick-start the joyous season, check this post on Bahá’í Blog. This entry was posted in News on February 26, 2016 by Schulz Media & Consulting. A small update (1.6.1) with improved 3D Touch accuracy is out, and the new lowered price should active be active in all markets now too. It’s just about two weeks left before Ayyám-i-Há! If you want to gift the app to somebody, you can use the share-icon in App Store , and you will find the gift option from there. This entry was posted in News on February 12, 2016 by Schulz Media & Consulting. Press hard on the icon to create a new event, without opening the app first. You can now press (harder than “touch”) on a date to preview the list of events for that date — and then press a bit harder to open it. You can do the same with single events: Preview it with a press — and then open it event with a harder press. Swipe up while peeking an event to reveal available actions. These fun 3D Touch techniques are called “peek and pop”, and you also feel the physical “pop”-response from the device. If you let go before the “pop”; it simply returns, so you can keep “peeking” until you find what you are looking for — and then “pop”. You can do similar things in many other apps too. More on 3D Touch from Apple. This entry was posted in News on January 29, 2016 by Schulz Media & Consulting. All working well ! Update available. The problem with missing dates is now resolved in the latest update, and it’s on the App Store now. I understand that many people in non-European time zones have experienced this, even for some months. I’m very grateful to the people who sent screenshots and reports to make me aware of it (see contact-info on App Store, on the Facebook page and Twitter). I hope this will be a new fresh start for many users, and will focus on taking the app further in the months to come, as time and resources permits. Thanks for using this app! This entry was posted in News on December 3, 2015 by Schulz Media & Consulting.